Tangled and True: sally's clippies. I've never been one to get behind the large flower headbands and clips. That's not to say there is anything wrong with them, they just aren't for me. Instead I prefer the clips that are small but make a big statement. I like them relatively simple, hoping they add a little character to what the girls are wearing. Sally's Clippies has just introduced their new felt clips, and I have to say I am a fan. They aren't too big or too distracting, they look adorable in the girls hair and have already received rave reviews from everyone who has seen them. The come in multiple colors and styles and are sure to add just the right touch to almost any ensemble. 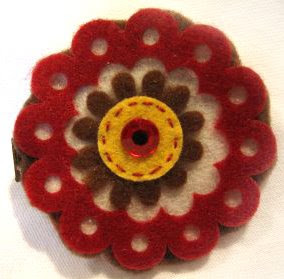 The felt clips are soft enough for even the smallest heads, hand-sewn and creative. They are truly my idea of adorable. 2 for $10 available here. Oh I totally agree, these felt ones are totally cute but I am not into the huge flowers on those elastic white bands.